4 November. At 9.40 GMT Metropolitan Bakhomios, the locum tenens, performed his last duty in that office by unwrapping the glass ball handed to him by the blindfolded altar boy, Bishoi Mossaed (himself chosen by lot from among twelve other altar servers), and announcing the name of the 118th Pope and Patriarch of Alexandria. The Divine choice had fallen on the General Bishop serving in his own diocese, Bishop Tawadros, it being coincidentally the new Pope’s sixtieth birthday. 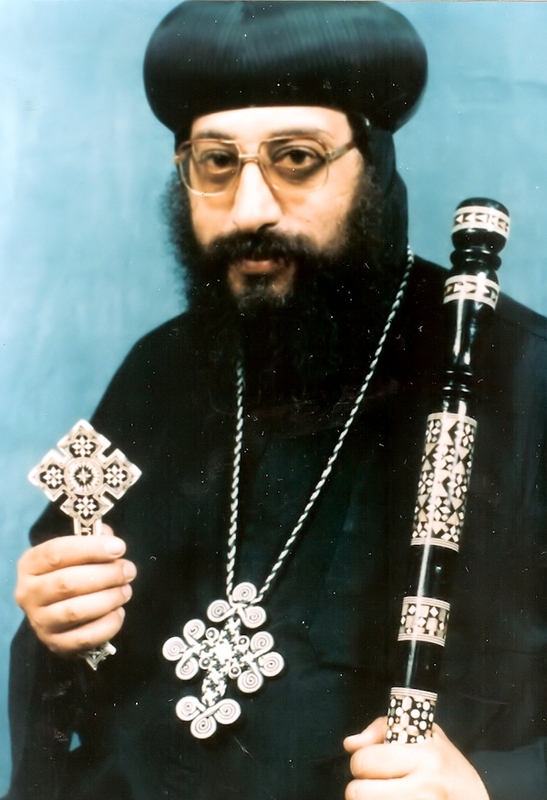 Bishop Tawadros had been consecrated at the hands of the late Pope Shenouda on 15 June 1997, at which Abba Seraphim had been privileged to assist as a co-consecrator. Abba Seraphim was himself travelling to Babingley when he received a message from his Egyptian secretary, Shenouda Mamdouh, which meant that in the Liturgy that morning he not only announced the joyful result of the Papal election but was able to pray for Pope Tawadros for the first time. He will travel to Cairo for the enthronement ceremony on 18 November. The new Pope was staying at his monastery of St. Bishoy in the Wadi El N’atrun when the Lot was drawn and on being told the news, replied, “I thank the Lord for His grace; I am undeserving.” He then joined the monks at the monastery in prayers and doxologies before the shrine of Saint Bishoy. A stream of visitors, led by Metropolitan Bakhomios, soon appeared at the monastery to offer their congratulations. Pope Tawadros II at the time of his episcopal consecration. His predecessor, Pope Tawadros (Theodore) I [731-742] was the 45th Pope of Alexandria. See Abba Seraphim’s Address on the Papal Election process.